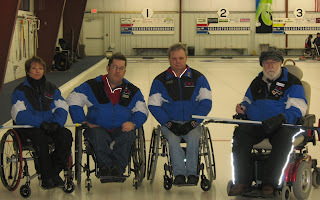 The Ontario Curling Association's controversial decision to allow only one wheelchair team per region to attend the provincial championships in Kingston at the end of the month (other curlers are allowed two) necessitated a playdown between the two competitive Region 1 Ottawa teams. On Saturday, Bruce Cameron skipped Doug Morris, Jamie Eddy and Christine Lavallee to an 8-4 win over Team Fraser, going on to win the best of three playdown with a 9-3 win on Sunday. The Ontario Dominion Wheelchair Championship will feature four teams and be held Feb 25-27,2009 at the Royal Kingston CC.